Who said you can't find free races? Whether it be related to a down economy--can't we blame everything on that these days?-- or a maybe a generous race director, there is a free race, a marathon even, taking place in the Seattle area this weekend. Yes, it might be a little late to be jetting off to the Pacific Northwest in time to reach the start line of the Green River Marathon by Saturday morning, but if you're in the Seattle area, or heading there for the weekend, and want a race to run, this could be it. Or just plan ahead for next year as the Green River Marathon's website says that the race is always free thanks to a dedicated group of volunteers and their donations. Even the $12 race T-shirt is at cost. 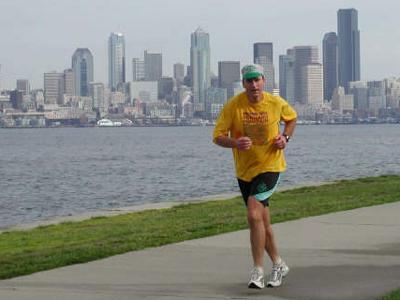 The 13th annual Green River Marathon kicks off at 8:30 a.m.--or 7:30 a.m. for the official early start if you need more than five hours to complete the 26.2 miles--and travels from Kent to Alki through the trail and park system. You'll follow the Green River as it winds toward Puget Sound and Alki Beach and you can spot the Olympic Mountains in the distance. I'm reading about the terrain wishing I wasn't running a marathon in two weeks or had the means to show up at tomorrow's start. Plus the 26.2-mile course is sanctioned by the USATF, so you can qualify for the 2010 Boston Marathon if you reach the qualifying standard.